The artist who started the movement which would decisively influence the Impressionists is Théodore Rousseau. Théodore Rousseau (don’t mistake him for Henry Rousseau, important point of reference for the 20th-century avant-gardes), was born in Paris in 1812, and abandoned soon the academic painting, which was the basis of his artistic training, for a freer way to paint, by observing the nature “dal vero” (in the open air). Since the late 1830s the Forest of Fontainebleau played the starring role in his paintings and became also his home, because Rousseau chose to live in the near village of Barbizon, and other artists, fascinated by this new way to paint gathered around him. The Barbizon School was born. The fundamental principle which revolves around the style of the Barbizon School is that of exiting the atelier to paint surrounded by nature, in order to seize the changes of light and shadows of the landscape as it appeared to painters at the very moment they painted. However, the paintings weren’t painted completely outside (which is, instead, the basic principle of Impressionism) but were completed in the artist’s studio. 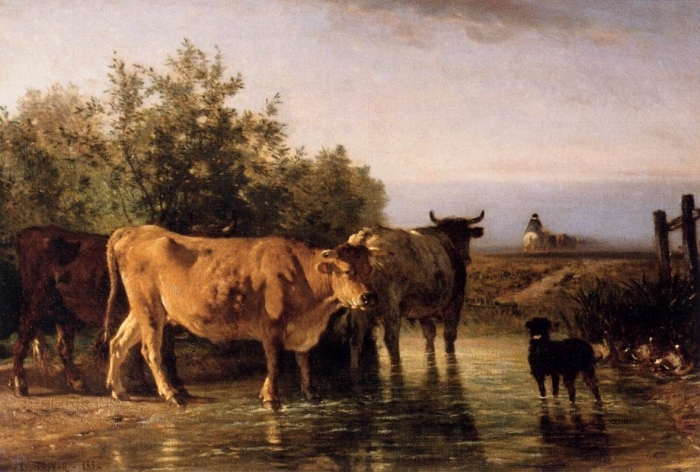 The works of the Barbizon School are not completely realistic, because, although the painters wanted to depict reality, they portrayed landscapes as they perceived them at that moment. The style and the technique of the Barbizon School derived from the experiences of Flemish and Dutch painters of the 17th century, and especially from John Constable’s works. The way in which the Barbizon School painters applied the colours with small brush strokes would be fundamental for the birth of Impressionism, which takes first steps from this artistic movement. Among the artists joining the movement was Charles-François Daubigny who more than others practiced plein air painting, which would be a fundamental element of Impressionists, sailing the Seine on a houseboat. Claude Monet and Renoir would be deeply influenced by his paintings. Other artists of the group were: Jean-François Millet, who was the first to introduce humble characters in his landscapes; Jean- Baptiste Camille Corot, author of works in which light is a very important element; Jules Dupré; Hippolyte Camille Delpy; Constant Troyon and many more.